What changes in Dispensary mode? What if there is not sufficient stock of one batch? Dispensary mode allows you to use mSupply to issue medicines to patients. It is ideally suited for pharmacies, clinics, hospital dispensaries, and facilities where medicines are supplied to individual patients. Item directions which can be quickly selected from standard abbreviations, and edited as necessary. Item directions do not need to be printed in English. Use of Dispensary mode depends on your mSupply registration type. Contact Sustainable Solutions if you wish to upgrade your registration. In client-server versions of mSupply, different users can be logged in in different modes at the same time, allowing you to dispense to patients and supply wards, stores, clients or cost centres simultaneously. Users whose permissions allow them to operate in either Store mode or Dispensary mode may change from one to the other by pressing Ctrl+2 on the keyboard. Re-entry of the user's password is not necessary. Now it's a setting for a store. Double-click on the store you want to set to dispensary mode. Select Dispensary in the drop down list next to the store's code field. When you log out of the store and back in, you'll be in the new mode. 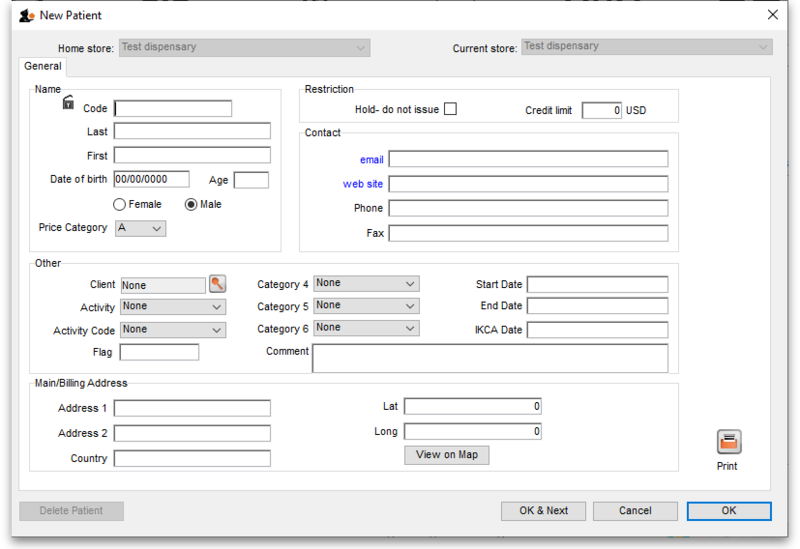 Choose File > Preferences > Invoices 2 then check the Show direction entry in dispensary mode box. In mSupply a “name” can be a customer, a supplier, both or neither. A “customer” can be anyone you supply goods to - e.g. another organisation, or a ward in your hospital, or a patient. Some of the menus in dispensary mode have different names. For example, the Customer menu becomes the Patient menu. The functionality of the common icons is the same as in store mode and applies mostly to customers not patients (a dispensary mode store can still distribute stock to customers (not patients) and handle customers' requisitions). For details of those functions, see the other sections of this guide. The windows displayed are appropriate for dispensing medicines to individual patients; in addition to the ability to record individual patient's notes (e.g. allergies), prescribers details are maintained. A patient history is maintained and other features specifically related to dispensing activities are maintained. When you are entering a patient name, mSupply will treat anything entered before a comma as a last name, and anything entered after a comma as a first name. 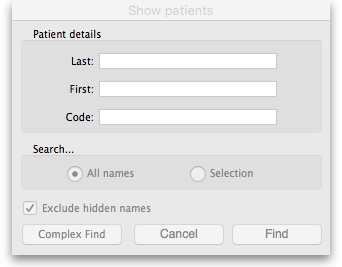 In the Name field (screenshot above) enter your patient's name, or even just part of their name, for example, 'Sn, R' for 'Rick Snail' - so just part of the patient's last name, comma, and then their first initial, and then press the tab key. If your patient is already loaded in the system, then this entry should bring up the patient in question, or a list of patients for you to choose from. Always search for your patient in this way first, before entering a new patient, to avoid entering the same patient multiple times. Once you have found the correct patient, double-click the appropriate line, and then click Use. Clicking the Print icon at this point will give you access to reports showing all prescription history. Once you've chosen a patient, the cursor will automatically advance to the prescriber entry field. Press the tab (not 'return') key after making the entry to show a list of matching prescribers. If only one presciber matches, the name will be entered directly without the list being shown. 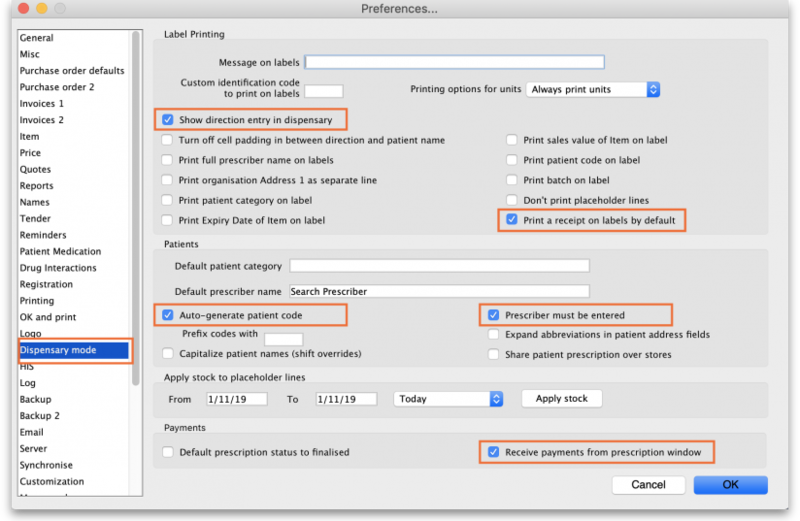 Note that there is a setting on the Dispensing page of the mSupply Preferences that affects whether or not you can accept and print a prescription without entering a prescriber. On the Prescription entry window click on New line , and Add item window appears. 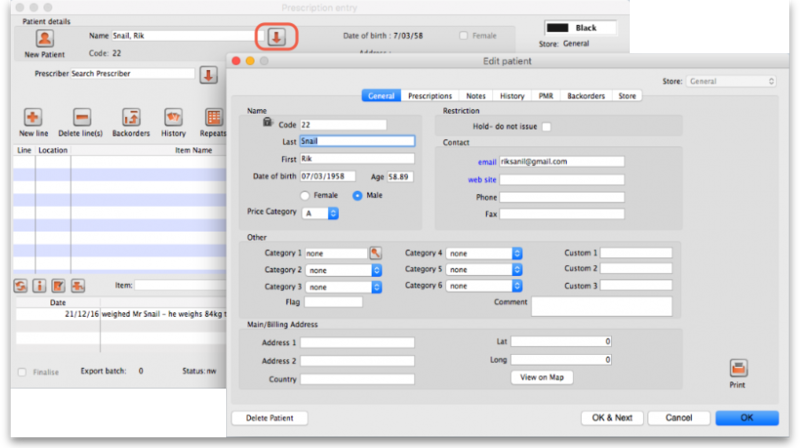 Once the item name and quantity have been entered, provided that the Show direction entry in dispensary mode option has been selected in Preferences, directions on how to take the medicine should be entered. This is the term mSupply uses to denote any item of information relating to a particular patient; for example, you may want to record the patient's weight, the patient's blood pressure, any allergies from which the patient suffers, vaccination records, etc. - a wide range of information relating to a particular patient may be recorded here. 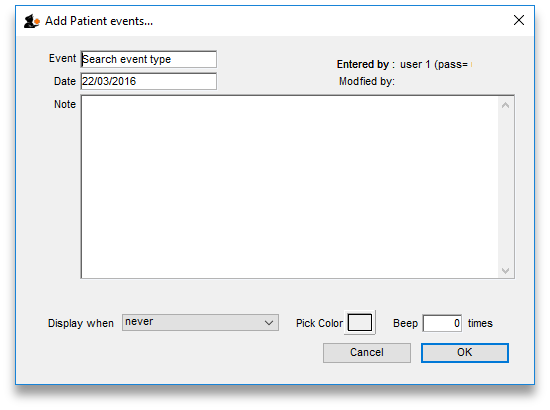 First, some definitions of patient events need to be made;choose Patient > Show Patient events , then click the New button. Now it is possible , using the Notes tab of the patient details window, to add individual items of information to the profile of any patient. View the record of the patient in the normal way (from Patient > Show Patients, enter the patient's name & double click the appropriate patient from the 'names output' ) , and select the Notes tab. Click on the Add event button to bring up the window shown above. In the Event field, Search event type appears by default. 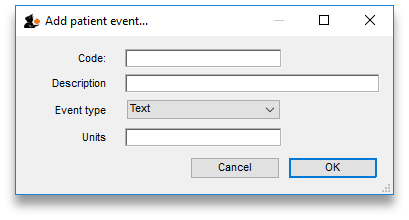 To display all the events you have defined so that you may choose the one you require, enter the character “@” (without the quote marks), press the TAB key, and make your required selection from the list. Alternatively, you may enter a word from the description of the event - e.g. if you have defined Patient's body weight as an event, you may enter the start of the event name or code (e.g. pat ), and that event will appear in the Event field. If more than one event matches what you have entered, a list will displayed for your to choose the event you want to enter. Should you wish to add any note or comment, you may do so by moving the cursor into the Note area, clicking, then typing your entry. You can customise the note in terms of when it will be displayed on screen etc. as described in the Items chapter of this guide. Here's the link - The Notes tab. A new event may be added by clicking on the Add event button, and an event which is no longer of any relevance may be deleted by clicking on the Delete event button. Events may be edited by selecting the specific event, double clicking on it, when the Edit patient event window appears. For many commonly prescribed items, default direction abbreviations can be defined - refer to the section on Item Default Directions. In the example below, the item being dispensed is FRUSEMIDE 40mg tablets, and the default directions are “Take ONE tablet in the morning”. Alternative directions present may be displayed by clicking on the down arrow to the right of the abbreviated direction field; directions not already present may be typed in using either the Abbrev entry area, or the Expanded entry area. Note that you can mix abbreviations and text like this. The drop-down list shows any default abbreviations you have entered for the chosen item. If one or more default abbreviations exists, the highest priority default abbreviation will be 'suggested' when you choose the item. If there is more than one standard abbreviation available, you can choose another one by choosing it from the drop-down list. mSupply stores the expanded text for each line, not the abbreviation. This means that there is a full audit trail of what was printed on the label (unless you edit the directions after printing!). The set up of default directions is done on the dispensing tab when editing an item. You will find it described here. mSupply currently is designed to work with the Zebra TLP 2844 label printer. The Zebra is a very nice printer. It can use either thermal labels or a thermal ribbon which gives non-fading results. We currently support plain 90 x 40mm label stock as this is cheap and readily available. The Zebra printer is auto-sensing of the ending of a label, so you can most likely used labels longer than 40mm with no problems. We are happy to support other printers if you use a different brand. If you need to print the labels for an item again, choose Patient > Show Prescriptions to locate the prescription entry. 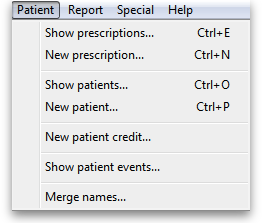 In the Prescription Entry window, click the New Patient icon to the left of the name entry area. 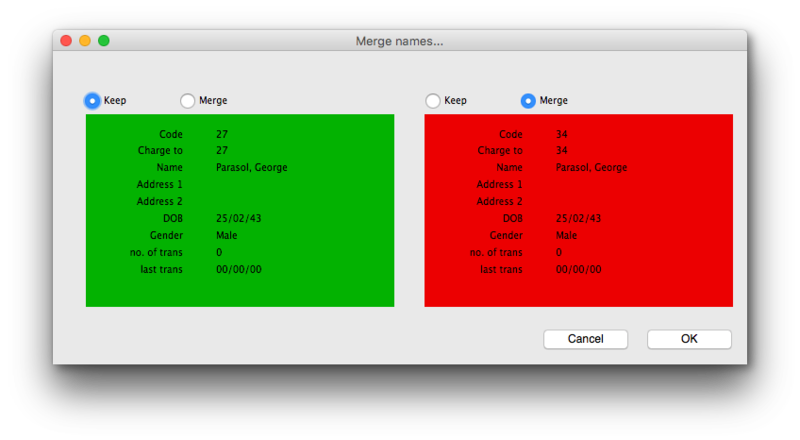 This window will be shown (Shortcut: Ctl-Shift-P). All entry fields are blank, except for the Code field where the entry shown is the next number in the table of unique numbers applied to each individual patient. Code and Last are required fields but all applicable fields should be completed. 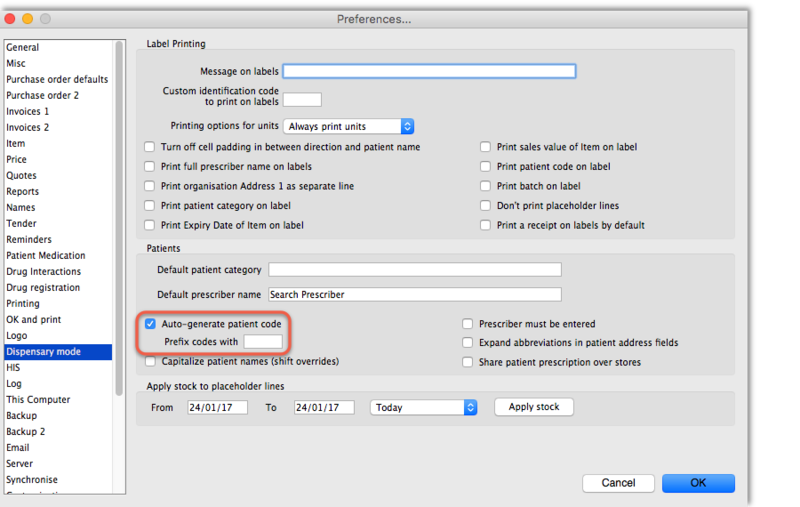 Please note - the patient code will only appear if this setting has been selected in Preferences. If the new patient's date of birth is known, it should be entered, otherwise an entry should be made in the Age field; for a patient aged 18 months, valid entries in the Age field may be in one of 3 formats, namely 18m, 1.5, or 18/12. When a patient's code is known, that patient's record may be rapidly displayed. Note also that the Male radio button is checked; if you are entering details of a female patient, remember to check the Female radio button!. Custom fields are available for storing information such as insurance details etc. If you want to print more that one label for an item, hold down the Alt key ( Option on Mac) as you click the OK button. You will be asked for the number of labels required as the label is about to print. As the quantity of a particular batch of an item gets used up, you will need to issue stock from more than one batch to a patient. mSupply handles this when printing labels, and combines the totals for any item on a prescription so that only one label is printed for the total quantity. The directions for the item with the first line number will be used, so enter directions for the first batch you dispense, and leave the directions empty for subsequent batches. 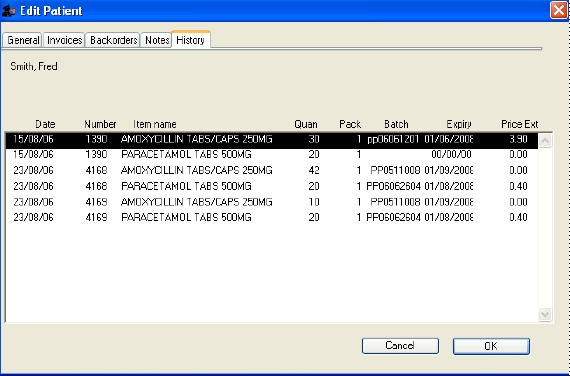 Note: if you have the rare situation where you need to issue the same item to one patient with different directions you should either combine the directions onto the one label, or enter two prescriptions with the directions entered differently on each prescription (That is enter the line, then print the label(s), then choose Patient > New prescription and issue the item again with the second set of directions). In the new prescription entry window, once you have entered a patient name you can click the “history” button to view a patient's history of what you have dispensed. 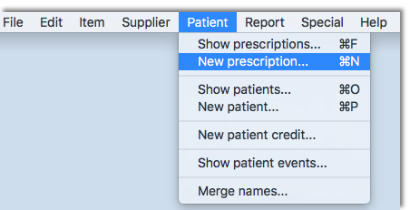 Once you have a history window open you can click to select a single entry or control-click to select multiple entries, then click the “duplicate” button to create new prescription line(s) with exactly the same details. Stock will be issued for these lines automatically. 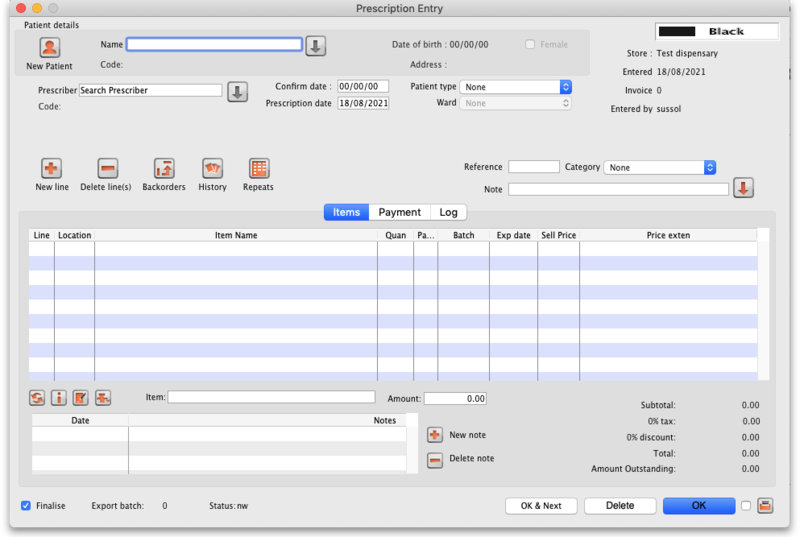 mSupply allows for the recording of repeat prescription. 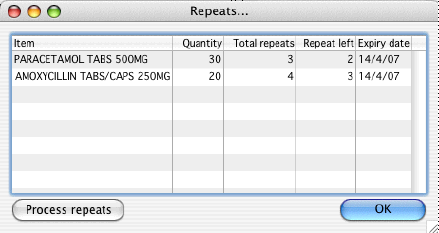 This is achieved when the prescription is first dispensed; in the Add item window, click on Total field in Repeats box in the top right corner of the window, and enter the number of repeats that the prescriber has authorised. The Repeat Dispensing procedure is described here. While dispensing, you may observe that a patient has been inadvertently entered twice. Here you need to decide which record should be kept, and which one should be merged, and check the appropriate radio buttons. This combines the information in the record to be merged with the information in the record to be kept. You can view a patient's details on-the-fly as you enter a prescription as described above. You can also view patients by choosing Patients > Show patients. You will be shown a list of matching entries, or taken directly to the detail view if only one patient matches the values you entered. The details displayed are similar to displaying a customer in store mode. However there is also a history tab that shows each item dispensed. 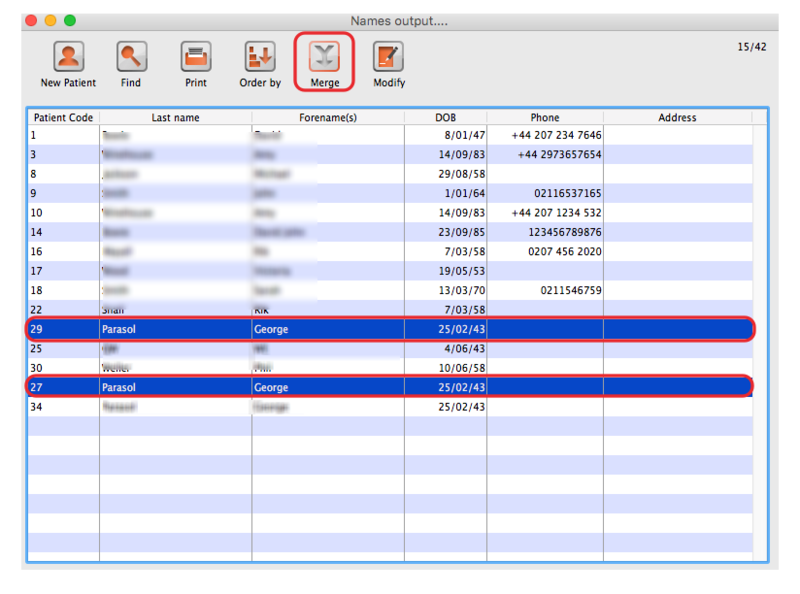 Double-clicking an item in the list will display the transaction in a new window. 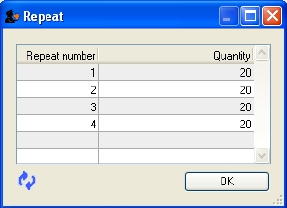 The number of repeats is assigned in Total field in Repeats box, and as the repeats are dispensed, the number remaining is displayed in the Left field. When you click on the blue arrows on the upper right side ,the total repeat number and total quantity for each repeat is shown. Clicking on the small arrow displays the window below. This window allows the user to alter the quantity of a particular repeat - e.g. if there is insufficient stock on a particular visit of the patient; the quantity can be edited by clicking on the quantity line, and again clicking on the quantity, which may now be edited. The arrow on the left bottom corner enables you to restore the default quantity setting. Once you have filled repeat and other details on the Add item window properly, click on OK button to save details . 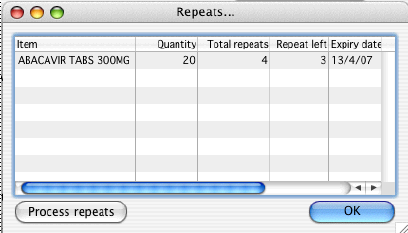 The Repeats icon is contained in Prescription entry. The repeat window shows items to be dispensed, quantity, total repeats, repeats remaining and expiry date for a particular repeat. Process repeats and OK button are described below. This button is used to issue the repeat for a particular patient and for a particular item line. 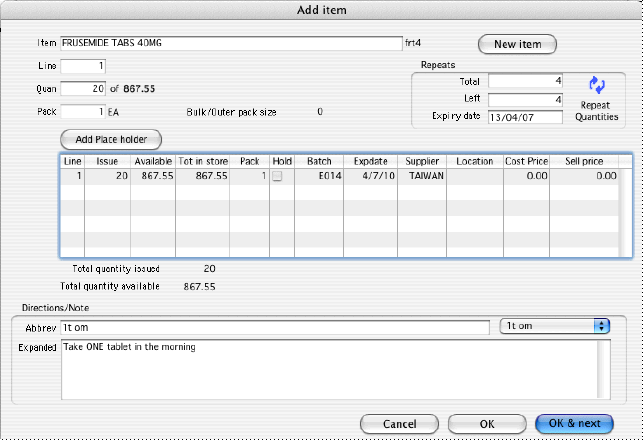 For issuing the repeat, first select a desired item line and then click on the Process repeats button. Now the system automatically manages the repeats internally. When the Print Receipt option is checked in the Prescription Entry window, the printer will, after printing the medicine labels, produce a patient receipt as shown below. Should you wish to use a different printer for receipts, this option can easily be incorporated in mSupply if you advise us of your requirements. 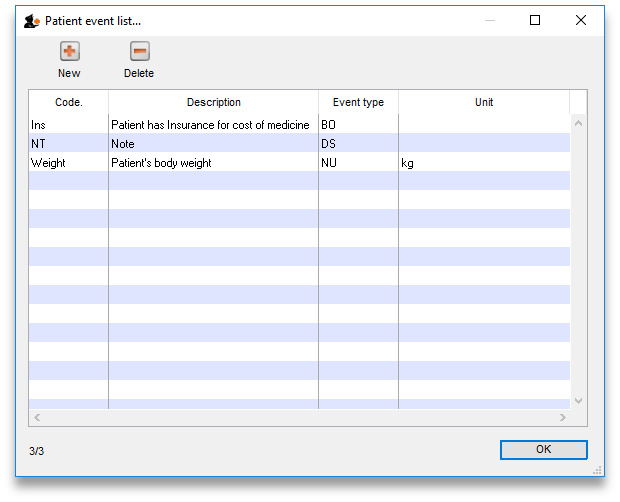 Any notes/events you enter in the notes tab will display each time you enter the patient name in the Prescription entry window. These notes can be used to remind you of patient Preferences for certain dosage forms, or drug sensitivities. Before you add an event for a patient, you need to make sure that patient events have been set up.